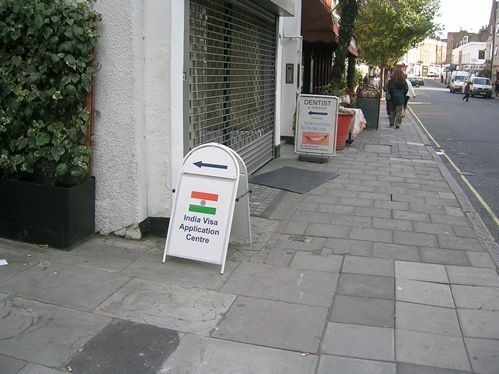 ANDREW THOMAS of this yard round here right now might have had problems getting an India visa, but we can tell you the new system is 100 feet ahead of the old one which used to happen at the Indian High Commission in the Strand. Not only is it efficient, it is effortless, so when we put our application in for an Indian business visa on Monday it was ready by Wednesday afternoon. One question remains. India is promoting its “Incredible India” programme, via TV and street adverts. Why do tourists going to India have to have two sponsors before they can get a tourist visa? Obviously I am no tourist, and go to India for business regularly. How can no-one who has ever been to India ever before in the whole of their lives have two referees in India who know them? The people at this place near to Victoria railway station (picture below) are super efficient. I won’t hear a word said against them. This entry was posted in Uncategorized and tagged Incredible India, India, tourists, visas. Bookmark the permalink. Don’t agree. Last time I got a business visa from the High Commission, in April, it took a total of one and a half hours. I went last month to this new place near Angel, to change to an employment visa, and they did not understand the paperwork. The whole process now delayed for months. Great improvement…! In Gaucholand to have a passport issued you arrive and leave in about 3 hours… everything is digitised (fingerprints, digital picture, etc), yet… you leave without the passport. The printing takes about a week and the delivery (by registered mail) about 3 weeks more. They blame it on the “special paper” and “security measures” (sic). Of course there’s a line for VIPs (business execs etc) were you can get your passport printed in about 3 days. Arriving in India as the New York Times foreign editor without a visa. I had assumed that I didn’t need one. It took our bureau chief there several hours to extricate me from Indian bureaucracy. I felt like an idiot.